VAMA Divani offers a wide range of contemporary armchairs, very eye-catching and well-finished furniture items, as they are characterised by particularly original and innovative styles. 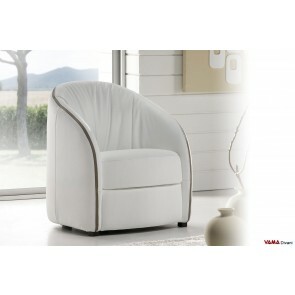 These armchairs are the result of a very careful and accurate design work, as well as, of course, of the professionalism and experience of the VAMA Divani Italian craftsmen. Upholstered in high quality materials, such as leather and fabric, these armchairs feature a very solid and sturdy internal structure which offers to the model a great longevity. Among so many offers, you can easily find the most suitable contemporary armchair for your environments, moreover, many of these models can be customised in any detail and size. 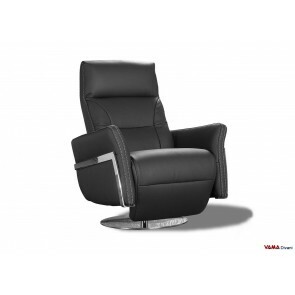 The Nikita leather reclining armchair presents some really unique technical features: despite being without electrical controls, in fact, it allows the person sitting to modify the position of the seat back or the footrest with simple and light movements. The chrome plate, which forms its base, allows this reclining armchair to become a swivel one, just like the classic office chair. Characterised by an elegant and modern style, it can easily be combined in different environments, as it can be customised in any colour and upholstery as all our products. Original swivel armchair with chrome steel base and completely upholstered in high quality leather, a piece of furniture with a strong personality destined to become the main character of the environment in which it is placed. Embellished with interesting decorative details, this swivel leather armchair is exceptional for those who like modern and attractive furniture, it provides a great comfort and can be placed successfully in living rooms, offices and many other contexts. A leather armchair with a strong personality and which stands out to be customised in any colour and leather upholstery. Contemporary leather armchair characterised by a very original design, with lowered arms, large and high seat back and a soft and thick cushion. 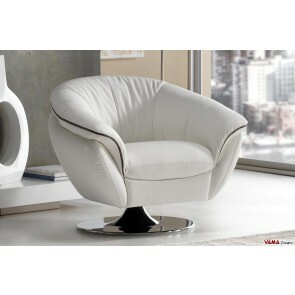 A great armchair perfect for any living room furnished in contemporary style, which can be easily combined. 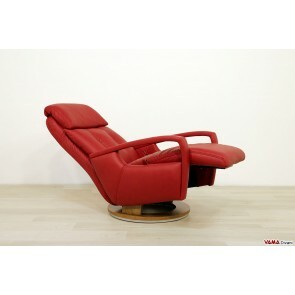 Very convenient and comfortable, it features a solid and robust structure and is made of top quality materials. Customise it in any colour and upholstery: contact us for a free quote. Contemporary leather armchair characterised by a bold and captivating style, offering a truly excellent level of comfort thanks to its ergonomic structure, its soft upholstery and its unusual raised headrest. Rich in valuable details, the Ginger armchair is ideal for living rooms, offices and any other context furnished in contemporary style, and can be customised in any colour and upholstery as all our products. Armchair characterised by a unusual and very charming design, entirely upholstered in leather embellished with a lovely contrast stripe. 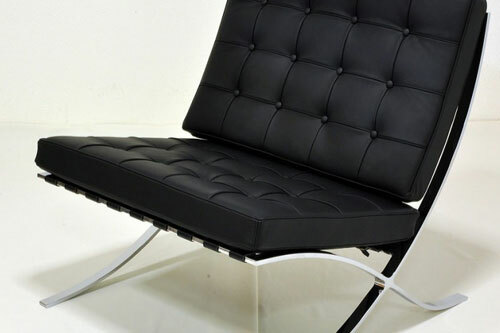 It can be customised in any colour and leather upholstery. Very comfortable, thanks to its soft seat, the Free armchair can be easily matched in many different spaces, and its small size allows you to place it successfully in little spacious rooms, such as living rooms, bedrooms, offices or any other kind of rooms. 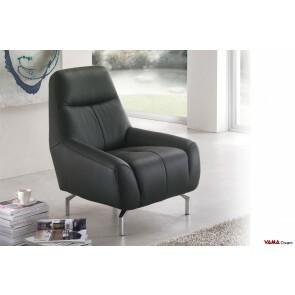 A comfortable leather armchair with a strong personality, clearly inspired by the style of the classic "cockpit armchair". 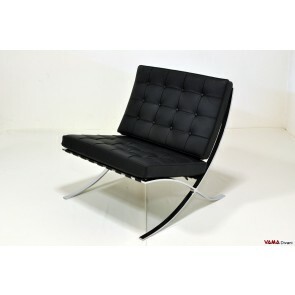 Famous Barcellona armchair, with chromed steel frame and refined cushions upholstered in high quality leather. A true icon of contemporary furniture, the Barcellona armchair provides great comfort thanks to its ergonomic design and proves to be stylistically perfect in different environments, not only in private homes, but also in offices and professional studios. Customise your own Barcellona armchair in any colour and upholstery: contact us for a free quote. 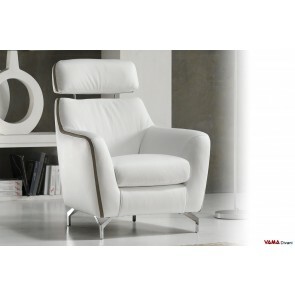 India is a modern relax armchair, a very interesting and particular creation that ensures a perfect comfort. Original and decorative, is an interesting choice for the house and for the office.